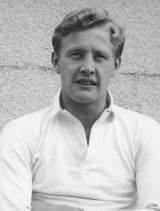 Mike Weston played for England 29 times between 1960 and 1968, captaining the side five times, firstly on their 1963 tour of Australia and then in his final two matches five years later. A broken leg sustained in 1965 interrupted his career and he admitted he was "never quite the same". A good all-round sportsman, he played Minor Counties cricket for Durham before they gained first-class status - his sons Phil and Robin both played county cricket - but his main sport was always rugby. A centre, although five of his caps came as a fly-half, he was picked for the Lions tours of South Africa in 1962 and Australia and New Zealand in 1966. He played in all four matches in South Africa but only two Australia Tests on his second tour. His last international hurrah was on England's tour of Canada in the autumn of 1968. He retired in December 1968, admitting that he had been suffering from a serious ankle injury sustained on the 1962 Lions tour and had only been kept playing through intensive physiotherapy. He remained active in the game, as a national selector and manager, taking charge of the England side at the first World Cup in 1987.